Pulp and paper production is extremely demanding, and companies in this industry place a high value on the quality and longevity of their production equipment. In order to ensure smooth operation of heavy-duty, high-force hydraulic systems, cylinders require robust and precise construction. With our proven mastery for processing heavy wall, long length alloy tubing, we are well positioned to meet the exacting standards of this industry sector. Constructed from high strength 4130 alloy steel, the cylinders highlighted in the photograph measured 51'3" in length. Primary operations involved inspection of the incoming material, precision straightening, centerless grinding, and polishing. Shipped to us with an outer diameter that measured 3-13/16" with a ¾" wall, we ground the outer diameter to 3.752" while holding the +.000 -.004 tolerance the entire length. By executing fine-tuned control over the straightening process, we achieved a .005/ft. TIR. 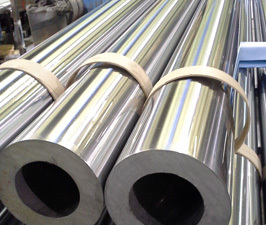 Finally, multistep polishing processes allowed us to finish the cylinders with a consistent 8 RMS maximum surface finish free from even the slightest defects. Continual and documented visual, dimensional, and surface finish inspections confirmed that this project met the client specifications. This project also called for careful methods for handling and packaging the workpieces to preserve their integrity. The client was very impressed with the quality of our workmanship and the care we took in protecting them from damage during shipping. We continue to process them in lots of 7-10 units on a 10 day turnaround. Before Grind Diameter Dimension 3-13/16" x ¾"
After Grind Diameter Dimension Ø 3.752"